Ruffles and gathers are really hot in fashion right now, not to mention very useful to know how to do for lots of Halloween costumes. Click on the image to enlarge and read these really great instructions on how to sew gathers. This comprehensive “at your fingertips” reference is an essential for any sewer's library. With more than 1,000 detailed illustrations and an instructional DVD from SINGER®, this book covers all the basic sewing techniques for garment construction and home décor. An entire section on mending and repair helps sewers recycle and reuse their favorite items with quick and reliable fixes. This useful volume will help sewers of all levels find reliable shortcuts and better solutions to ensure success with all their sewing projects. 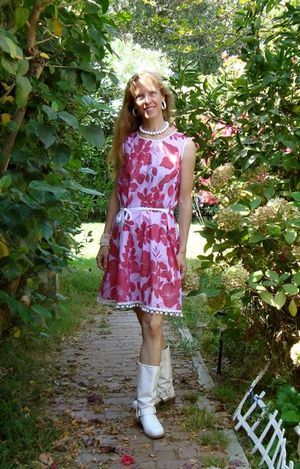 Beth Baumgartel (Madison, CT) has written for Vogue, Butterick, the Home Sewing Association, Family Craft Circle, and others. She is also the author of SINGER® Simple Decorative Machine Stitching. I used wider bias strips along the bottom and trimmed the front top edge with a tiny ruffle. 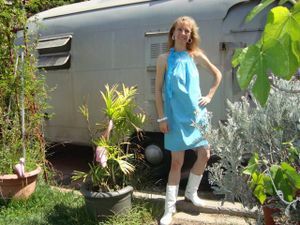 Here is how to sew a little dress from 2 men's shirts; in this case I used 2 Boy Scout shirts. I cut one shirt into the dress shape and sewed two ties. They get placed into the dress when the side seams are stitched. The final step after the dress is all sewn together is to stitch a bit of elastic along the back top edge. The other shirt gets cut open so that the bias strips can be cut as long as possible -- as you can see I had to use 2 grid rulers for the first cut. Then I could fold the shirt in half along the true bias and cut the bias strips out with one long grid ruler for the ruffles. I should point out that you really do need to cut the ruffles on the bias because they will shred apart if you are using a woven shirt. I followed the directions for sewing a gather in Singer Simple Sewing. The only thing that I did differently was I sewed a single row of stitching down the center of each strip. Then I top stitched 2 rows of ruffles along the bottom edge of the dress and one tiny one along the top front edge. I removed the patches from the shirt and restitched them on in new places. Here is the dress from the back. My dress form is a bit wider than me so when I wear the dress the elastic on the top back edge looks cute gathered not all stretched out like it is here on the dress form. If you aren't up for making a whole dress, why not jazz up one you already have with some ruffles or lengthen one with a gathered section? So you have a sewing machine, just got a sewing machine, know someone who wants to learn to sew or just plain want to have a comprehensive book on all the details of the basics of sewing....and then some more great stuff? This is the book AND DVD for you! I teach beginner sewing and this is just about exactly what I teach...you can't go wrong with this book. And in addition to all the great basics these were two pages that really popped out as really cool to me because I don't know about you but my bathroom is the easiest, quickest and fun to redecorate and revamp. I love swapping out my shower curtain and towels for a new look. Confession time, it is currently decorated in Hello Kitty. Click on these images to enlarge and read how to sew a shower curtain and the sizes of bath towels so you can sew your own! So sew something why dontcha! This book is packed full of great info! The Complete Photo Guide to Sewing – Revised and Updated Edition is the one reference every sewer needs. Its 352 pages and 1,200 photographs cover every aspect of fashion and décor sewing. Sections include choosing the right tools and notions, using conventional machines and sergers, fashion sewing, tailoring, and home décor projects. Included are step-by-step instructions for basic projects like pillows, tablecloths, and window treatments. Sewers from beginners to the skilled will turn to this book again and again. The lifestyles editors of Creative Publishing international have created many trusted and timely classics on sewing, needle arts, and all kinds of crafts. All of our books are researched, written, and edited by professionals and artisans who have practiced and promoted their specialties for years. So a while back I posted this project of a lace trim Christmas tree and I guess I have lace on the brain. I don't think I ever knew how to sew or attach lace to fabric because I guess I was always crafting with it in unusual ways. But, wow, this is so cool! I didn't think it was so easy. Visit SewingIdeas.com for helpful tips, products, and much more! 15 (Well now 16) days of Holiday Goodness Giveaways! 16. What do you leave out for Santa? My Answer: We leave the traditional milk and cookies. The cookies though are my Great-Grandmother's recipe. We think Santa is a very good buddies with my Dad and so being that my Dad LOVES his Grandmother's sugar cookies, Santa does too. They are in fact always gone Christmas morning. Be sure to read the comments of others, maybe you can have a good laugh or get a great idea! A quick guide to creating fancy stitches and special effects--on any type of sewing machine. 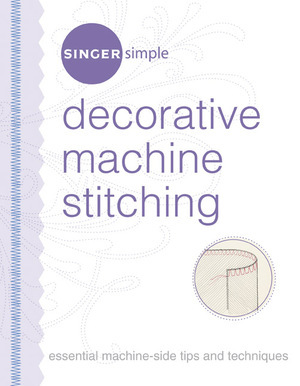 SINGER Simple(TM) Decorative Machine Stitching is a new book in the SINGER Simple(TM) series. This "at your fingertips" guide present dozens of techniques that creative stitchers -- of garments and home decor -- will refer to again and again. Inside is an indexed collection of decorative hand and machine stitches and specialty techniques, including beading, silk ribbon work, applique, and more. Clear, concise, colored line drawings illustrate the pages. The book is designed for readers working on any type of sewing machine. Although it provides an overview of the many types of software, specialty machines, and computer applications available for decorative stitching, this book presents techniques that succeed with even the most basic sewing machine. Bold page headings and color-tabbed pages help readers find information fast. Clear, concise charts--of hand and machine techniques, specialty threads, must-have accessories, and computer-based options--make it quick and easy to decide just which special touches to add to a project, and how. With all-new text and colorful, concise line drawings, SINGER delivers the same reliable information it's long been known for -- in a handy format and style that will appeal to the modern sewer. The sturdy, spiral-bound, stand-up format makes it easy to refer to machine-side and durable enough to withstand constant use. Other books in the series include SINGER Simple(TM) Sewing Guide, SINGER Simple(TM) Home Decor Handbook, SINGER Simple(TM) Mending & Repair. Click on image to enlarge and read. I wanted to share this page today because last Sunday was our Church of Craft meeting and we were all talking about making holiday gifts and how we all wanted to make our own gifts but time tends to slip away and well then off to the mall we go! So I thought I'd post a little help on designing, which is of course is the first step. This Singer book is packed full of great info for sewing and designing, truly an asset for the DIY-er. So now people is the time to get a plan together. That's not to say I have my plan together yet, but I am working on it. Which brings me to today's question, that if you leave an answer in today's s comment section you will be entered to win a copy of any Quayside Publishing Group's craft titles!!!! A gift for you, and you know you will love it because you get to pick it! Just leave a note saying what you are crafting up for this holiday season as gifts, decoration or otherwise. If you have a picture posted, leave a link so we can see! We'll pick a random winner from all entrances posted before October 20th. One-Piece Wearable Samples That I don't want to send back! 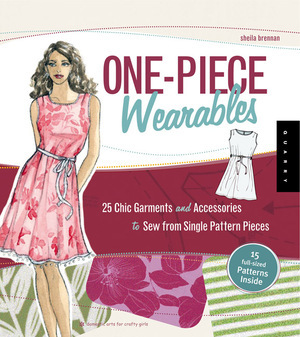 One Piece Wearables is a new book out that I just love. 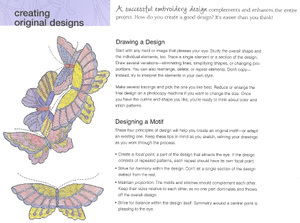 The book contains wonderful illustrations of the projects, but we thought you might like to see a few of the samples. This is the back of the cool jacket. I love when things are adjustable and have bows! This is the same dress I made in this post out of a recycled pair of plaid pants. And what am I wearing around my neck you ask? Why it's one of the projects from Sweater Surgery! Have I mentioned my love of the pom pom lately? This little blue number is so mod! Um, gee I think it is going to...uh...get lost in the mail!!! Ya, ya that's what happened! Simple but elegant fashions requiring minimal sewing and cutting! Each modern and stylish piece is made using a single pattern piece, which is then snipped, trimmed, twisted, folded, and stitched. Each garment is accessible to even those with little sewing experience but also novel and appealing enough to attract experienced sewers. 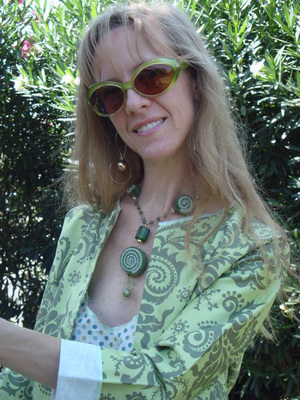 Projects provide readers with the inspiration and instruction to make customized, versatile wardrobe pieces that can be made in any range of fabrics and worn in combination or alone for a variety of style and fashion effects. Each project featured in this book is made from a single pattern piece. Requiring minimal investment, simple sewing techniques, cutting, and creative yet simple folding, fashions can be made out of a range of fabrics providing limitless styles for each pattern. Many pieces can be worn multiple ways and in many different combinations with other pieces, ensuring endless style variations and to create an all-purpose wardrobe for all occasions. Sheila Brennan is a designer who has worked in top companies in the fashion industry in New York, London and Paris for over ten years. She is both a talented designer and a skilled patternmaker who has always questioned traditional ways of looking at clothing construction. She is inspired by designers who are known for their innovative approach to fashion, such as Issey Miyake, Madeleine Vionnet, and Comme des Garcons. 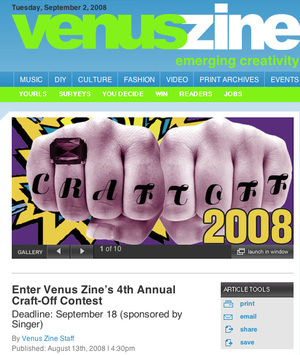 Venuszine and enter their contest sponsored by Singer. You could win a Singer 8763 Curvy sewing machine! Click on the Singer link on the right or below to get some inside peeks into the great line of Singer books!